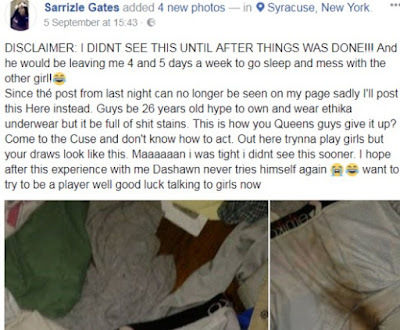 An American lady, Identified as Sarrizle Gates, on Facebook called out her ex-boyfriend who cheated on her, and even went as far as sharing pictures of his dirty underwears, he didn’t see them until they broke up. “DISCLAIMER: I DIDNT SEE THIS UNTIL AFTER THINGS WAS DONE!!! And he would be leaving me 4 and 5 days a week to go sleep and mess with the other girl. Since the post from last night can no longer be seen on my page sadly; I’ll post this Here instead. Guys be 26 years old hype to own and wear ethika underwear but it be full of poo stains. 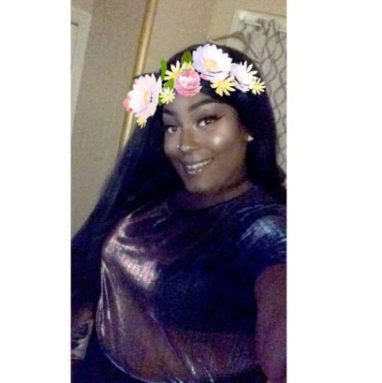 This is how you Queens guys give it up?